FILE - Myanmar State Counselor Aung San Suu Kyi walks between meetings at the ASEAN Summit in Vientiane, Laos Sept. 6, 2016. De facto Myanmar leader Aung San Suu Kyi will visit Washington Wednesday to discuss whether changes to the U.S. sanctions against the country can help spur much-needed economic growth, a Myanmar official said. It will be the first U.S. visit by the State Counselor and Foreign Minister since her National League for Democracy (NLD) government assumed office in late March. Myanmar’s democratic transition, after decades of military rule, is considered a major foreign policy success of President Barack Obama’s outgoing administration, which is mulling how it can further support the process in the country also known as Burma. State Counselor Office spokesperson Zaw Htay said Aung San Suu Kyi was seeking U.S. support for the country’s economy - which was wrecked by the former junta’s mismanagement and international isolation - in order to meet the hopes of those who supported the NLD’s landslide election victory last year. “Myanmar’s people’s expectations are very, very high right now - economic development can be a very strong signal to move forward in our democratization process,” he told VOA. “Myanmar needs much technical support, especially in the financial and economic sector,” Zaw Htay said, adding, “sanctions will be one of the issues on the table,” though he expected no quick changes to the web of restrictions affecting Myanmar. During her meetings with President Obama, Vice-President Joe Biden, Secretary of State John Kerry and leading members of Congress, including Republican Senator John McCain, Aung San Suu Kyi is also likely to address other challenges for her government. In August, she led Myanmar’s most-inclusive peace conference yet, involving most ethnic armed groups, top army officers and political parties, though it was only a ceremonial opening for her government’s efforts to end the decades-old civil wars. Last month, the government also announced the creation of a commission lead by former U.N. Secretary General Kofi Annan to resolve Buddhist-Muslim communal conflict in Rakhine State. Some one million stateless Rohingya Muslims suffer persecution or discrimination in the state, with about 120,000 still displaced by violence. FILE - 17-year old Rorbiza rests at home of Dapaing, North of Sittwe, western Rakhine state, Myanmar after escaping from a human trafficking boat. The White House and Congress placed a growing number of sanctions on Myanmar during the past 20 years. Restrictions were set on jade and gemstones, and on businesses linked to the illegal drug and arms trades. Companies owned by more than 100 “crony” businessmen connected to the army were also placed on a U.S. Treasury blacklist. 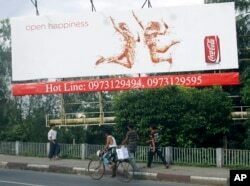 Some sanctions were eased in 2013 and several major U.S. companies, such as Coca Cola and General Motors, entered the Myanmar market. But many U.S. companies and Western banks remain wary of dealing with local businesses. The European Union lifted all sanctions in 2013, except on arms trades. The sanctions were seen as leverage to encourage further democratic reforms and Aung San Suu Kyi has not called for an end to sanctions since taking office. “If we are going along the right path, all sanctions should be lifted in good time,” she said during a visit by Secretary of State John Kerry in May, while also playing down the sanctions’ economic impact. Erin Murphy, president of U.S.- based Inle Advisory Group, said the NLD government appears to lack “a full understanding of the impact of sanctions, and the leverage they do and do not have,” but could now be reconsidering its support for the measures. “If the NLD wants to spur foreign investment, the lifting of U.S. sanctions would certainly contribute to investor's reassessment of the market and also spur others to expand,” said Murphy, whose firm advises investors in Myanmar. Myint Soe, chairman of the Myanmar Garment Manufacturers Association (MGMA), said lifting sanctions would be good for the garment industry, a sector that has rapidly grown since Myanmar’s economy opened up, but that has had limited access to the U.S. market. “So after the lifting of all the sanctions, we can get more, bigger export to the United States,” he told VOA. Myint Soe said just under 10 percent of the $1.65 billion worth of garments is now exported to the U.S., a market share that was around 65 percent before sanctions hit the garment industry in 2001.